I'm back in Paris and as usual when I arrive, the Internet has stopped working. I think that I must create disturbances in the field-- at least, this is the only explanation I can think of for why my telephones always seem to be on the blink and the wifi never stays connected. I feel sure that in the future someone will discover that certain people do indeed emanate weird electricity. This will be about the same time it is discovered that vegetables are actually bad for children. On arrival at CDG, I saw a huge crowd around the television in a cafe, watching the Croatia-Germany match. Even three soldiers in camouflage who were supposed to be patrolling the airport were watching instead, their machine guns cradled in their arms-- looking guiltily around from time to time. I went to buy my favorite French newspaper, Le Parisien. I couldn't see the paper anywhere. 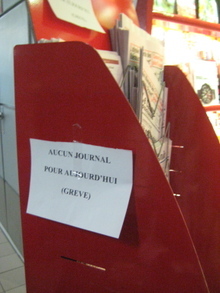 Then I noticed the panneau: "Aucun journal pour aujourd'hui (grève)" [no newspaper today (strike)]. On the way into the city, the taxi driver, a Thai woman, warned us that there was a big strike tomorrow. "I hope you are not going anywhere!"